It's no secret that dolphins are among nature's most skilled swimmers - but their grace and athleticism isn't limited to amazing underwater feats. 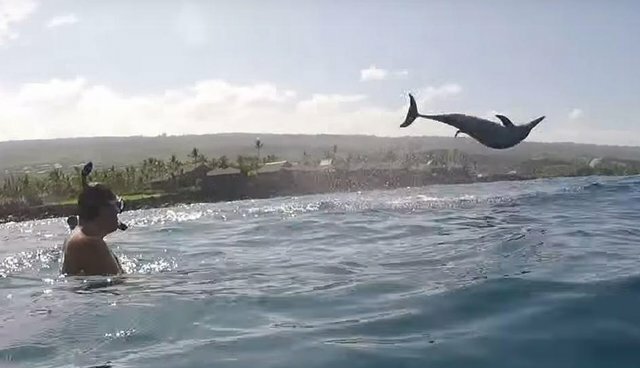 Snorkelers in Hawaii were recently treated to an extraordinary exhibition of one dolphin species' acrobatic ability. While exploring the waters off the Big Island, the group was visited by several spinner dolphins, one of whom was gracious enough to dazzle them with a stunning series of airborne barrel rolls. Best of all, the whole free show was caught on film. Spinner dolphins, aptly named for this remarkable behavior, are capable of rotating up to seven times in a single leap. In fact, this special skill is so impressive that scientists have set out to study how they're able to do it. It's not known for certain what inspires these animals to perform these spins, though researchers suggest that it could be to dislodge parasites or pesky remoras.